Is the first of its kind still the best in its class? Nearly 20 years ago, Lexus introduced us to the mid-size luxury crossover SUV. Sharing its platform with the ES sedan, that first Lexus RX offered the seating position and styling of an SUV with the plush ride quality of a luxury car. While other automakers have altered the recipe to create larger, richer, and more sporting luxury crossover SUVs, the RX remains the original. And it’s a formula that works, with Lexus selling nearly twice as many RX crossovers in 2017 as it did ES sedans – the brand’s best-selling car model. Still, Lexus isn’t simply resting on its laurels, and the Japanese luxury brand regularly makes small tweaks to the model: the most recent being the addition of the three-row RX L. Arguably, the most noteworthy change, though, came with the introduction of the RX 400h in April 2005. 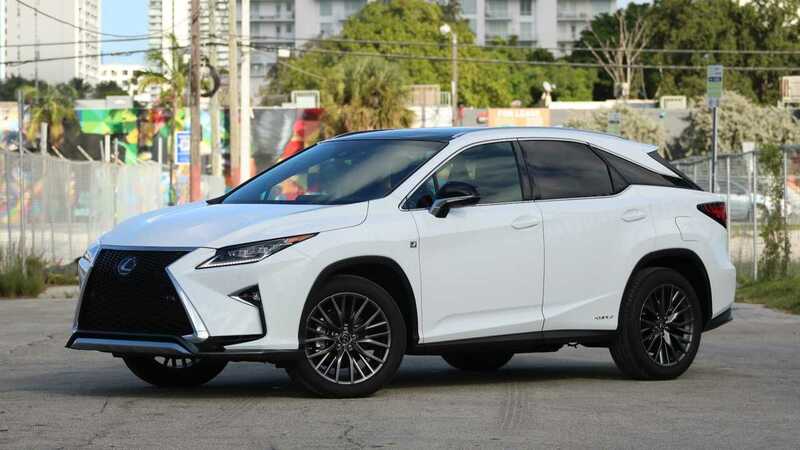 Now wearing the RX 450h designation, the gasoline-electric crossover combines the comfortable qualities of the standard RX 350 with the efficiency of a hybrid powertrain. It’s a relative value, too. Still, time is taking its toll on the model, and the RX 450h is beginning to feel somewhat antiquated next to plug-in hybrid crossovers such as the Volvo XC90 T8. With a starting price of $45,895, the 2018 Lexus RX 450h costs $6,205 less than its closest competitor, the $52,100 Acura MDX hybrid. Unlike the seven-passenger MDX, the RX comes standard with seating for five. Those looking for more passenger-carrying capability can spend $50,620 on the 4.4-inch longer, seven-seat RX 450hL. Doing so, however, requires forgoing the available F Sport appearance package. The $5,330 option is exclusive to the smaller RX and adds features such as a racy body kit, a set of 20-inch wheels and tires, an adaptive suspension system, heated and ventilated front seats, and a digital gauge cluster. All of this comes on top of the RX 450h’s already formidable standard features list, which includes items such as automatic high-beam headlights, rain-sensing windshield wipers, a proximity key with push-button start, 10-way power front seats, a power tilt-and-telescoping steering wheel, adaptive cruise control, lane-departure warning, and lane-keep assist. This Ultra White test car also included $9,595 worth of additional extras, which – along with a $1,025 delivery fee – brought the as-tested price to a hefty $61,875. That’s uncomfortably close to the cost of the $64,950 Volvo XC90 T8, which can seat seven and travel up to 19 miles on electricity alone. Credit Lexus for blessing the RX with distinctive styling. Like the strictly gas-sipping RX 350, the RX 450h wears the Japanese luxury brand’s now-ubiquitous spindle grille design. The gaping maw nicely complements the thin and angular front headlights, which sported $1,615 worth of LED illumination. Floating C and D pillars, as well as a steeply angled rear window, give the crossover a distinguished profile that’s arguably crossover-coupe-like (think BMW X6 and Mercedes-Benz GLE coupe). Blue highlights on the front and rear Lexus badges are a small nod to the gasoline-electric powertrain packaged within. On the whole, the exterior of the RX is rather busy, and it becomes even more so by choosing the F Sport appearance package, which adds even more aggressive front and rear fascias, an egg-crate-style texture to the gargantuan grille, and a set of big 20-inch wheels and tires (18s come standard on the non-F Sport RX 450h). Ultimately, the assertive looks of the F Sport kit appear antithetical to the comfort-oriented driving experience of the gasoline-electric hybrid SUV. Adding the F Sport package to the RX blesses its interior with a number of racy bits, including the rich Rioja Red leather that graced the seats and door panels of my tester. Other notable F Sport-specific kit includes aluminum pedals and interior trim, a set of steering-wheel-mounted paddle shifters, and a digital gauge cluster that mimics the look of the unit used in the Lexus LFA supercar. In the RX 450h, the cluster displays a speedometer and power-flow meter in Normal and Eco drive modes and a tachometer in Sport and Sport+. As expected of a vehicle wearing the Lexus badge, the interior of the RX includes high-quality materials and top-notch build quality. Both the heated and ventilated front bucket seats (included in the F Sport package) and three-across rear bench provide exemplary support and creamy cushioning – La-Z-Boy should take notes. Passenger space is plentiful, and those with long legs will find adequate room to stretch out within this crossover. Headroom proved more than adequate, as well, even with my test car’s massive $1,850 panoramic sunroof. The Lexus, however, falls short in its cargo-carrying capabilities. With only 18.0 cubic feet of cargo space with all seats in place and 55.9 cubes with the rears folded, the RX 450h is down almost 10 cubic feet to even the lowly Toyota Prius. This test car’s $200 touch-free power rear door, which allows the hatch to open by waving one’s hand near the rear Lexus emblem, at least improved access to its small cargo hold. While those in search of more space can opt for the larger RX 450hL, the model’s squarer rear end only affords it a mere 2.6 cubic feet of overall space behind its front seats. If comfortably carrying cargo is of great importance in your gasoline-electric hybrid luxury crossover SUV, then the three-row Acura MDX, which offers up to 68.4 cubic feet of cargo space with its rear rows stowed, is worth a look. Although the RX comes standard with an 8.0-inch infotainment display, my test car came fitted with the available 12.3-inch screen. Part of a $3,200 package that also includes an in-dash navigation system and a 15-speaker Mark Levinson audio system, the big screen can’t cover the lackluster performance of the Lexus Enform infotainment system. Plagued by unwieldy menus, middling graphics, and an ergonomically challenging mouse-like controller, the RX’s infotainment setup is slow to respond to inputs and unwieldy to navigate through its various displays. Even worse, the system is neither Apple CarPlay nor Android Auto compatible. My test car also included a color heads-up display. At $600, the feature is a relative bargain, as it puts important information, such as a speedometer, tachometer, and navigation directions, directly in the driver’s line of sight. Power comes courtesy of a 3.5-liter V6 engine and three electric motors: two up front, and one at the rear axle. Combined, the trio produces 308 horsepower, or 13 more than the V6 engine in the RX 350. Despite the hybrid’s extra horses, it’s no quicker than the non-hybrid model, and both all-wheel-drive RX’s scoot to 60 miles per hour in a manufacturer claimed 7.9 seconds. Blame the hybrid’s added heft – at 4,740 pounds, the RX 450h packs an extra 353 pounds in weight relative to its RX 350 counterpart. In the real world, though, the RX 450h moves with adequate aplomb. Credit the immediate torque of the electric motors, as well as the electric motor that works with the combustion engine by way of a planetary gearset to expertly dole power to the drive wheels in a way that mimics a continuously variable transmission. Included in the F Sport package are adaptive dampers. In spite of this kit, the RX remains rather lackadaisical when push comes to shove. The extra weight of the battery pack and electric motors surely does the crossover no favors. Nonetheless, the ride quality remains comfortable on all but the roughest of pavement (fault the thinner sidewalls of the 20-inch tires), while the steering is precise with no on-center slop. The tiller is appropriately light at low-speeds but adds welcome weight when sawing through corners. Most impressive, though, is the RX 450h’s brake pedal, which seamlessly switches between regenerative and mechanical braking without any noticeable jerkiness. Its engagement feels surprisingly natural and it puts almost every other hybrid and electric vehicles’ brake pedals to shame. 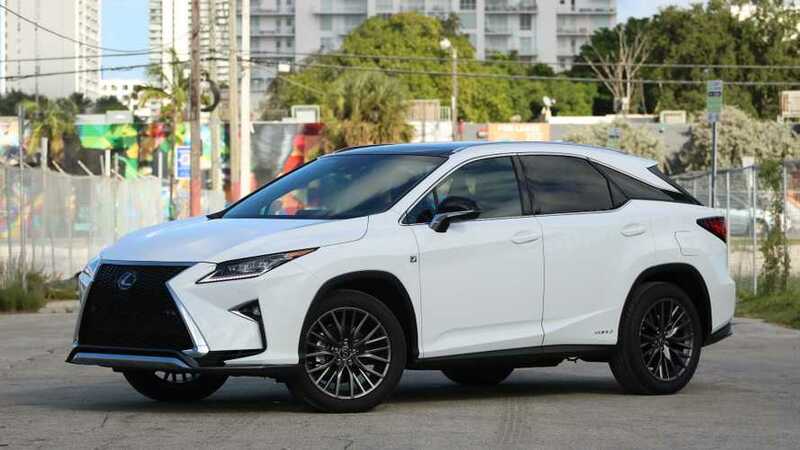 Thanks to the $265 Towing Prep package, which adds a heavy-duty radiator and engine and transmission coolers, the RX 450h can tow up to 3,500 pounds. It’s a small sum among mid-size crossover SUVs, but better than nothing, which coincidentally is the towing capacity of the Acura MDX hybrid. No matter the powertrain, every RX boasts a five-star rating from the National Highway Traffic Safety Administration (NHTSA) and a Top Safety Pick honor from the Insurance Institute for Highway Safety (IIHS), as well as standard active safety features such as automatic front braking, automatic high-beam headlights, adaptive cruise control, lane-departure warning, and lane-keeping assist. Additionally, my tester came equipped with a 360-degree camera and blind-spot monitoring system with rear-cross-traffic alert for $1,865. With EPA ratings of 31 miles per gallon in the city, 28 on the highway, and 30 combined, the RX 450h tops its gas-powered RX 350 kin by 11 mpg city, 1 mpg highway, and 7 mpg combined. It also puts the Acura MDX Hybrid’s 26 mpg city, 27 highway, and 27 combined figures to shame. But despite its overall efficiency, the RX 450h lacks the plug-in capabilities of pricier competitors such as the BMW X5 xDrive 40e and Volvo XC90 T8. Although rated at 24 mpg and 27 mpg combined, respectively, the bigger battery packs and exterior charging ports of the two European crossover SUVs allow each to travel an EPA-rated 14 and 19 miles on electricity alone.